At Summer CHA banners abounded everywhere. Each had it's own personality. Then Karen Lockhart created a fall banner for her darling grandson Nicholas, and I was totally enamoured. I thought that it would be fun to create a kit that would put all the necessary components together in to one package, including directions and enough product to make it the same as what I have done or to add your own twist and personality to it. Cosmo Cricket products are some of my favorite and so I choose the versatile "Be Good" line to piece together this kit. I think that the colors look so awesome next to a brick or wood fireplace. I can also see this pennant banner strung across the face of an old mirror, or over an open doorway. Including the ribbon this pennant extends approximately 48" in length. In creating this banner I did use my Janome sewing machine for the very first time! Oh what fun it is to sew so simply. 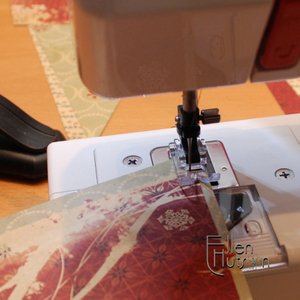 I highly recommend this little machine if you are interested in basic sewing on your projects. One little trick I learned was to place the needle in the "E" position and allow the foot to act as a guide - this helped me to sew oh so straight. If you enlarge the picture below you will see that the needle is aligned towards the left side of the foot. All I did was follow the center guide of my foot down my paper to create my perfectly straight seam. How cool is that?!? So if you were thinking about making a Pennant Banner this holiday season and this one appeals to you head on over to the store now. A limited supply is available and will not be restocked once these are sold out. Your banner is so gorgeous!! Thanks for the Janome tip! Wow--gorgeous, Ellen! I've been looking at one of those little machines, but I wasn't sure how I'd like it without a light. Does that bother you, or is it not an issue?